Your portfolio of projects exists for one reason and one reason only: to deliver strategic business value to your organization. But how do you know which activities, which programs and which projects add the most value? How should you allocate resources to deliver maximum impact? The answer is to use TransparentChoice to measure the strategic alignment of all your programs and projects and to use that alignment measure to ensure your team is delivering maximum value. Building agreement between your stakeholders about what your strategic priorities really are. Using these priorities to measure the alignment of your projects, initiatives and programs. Using the alignment score for each project to support more effective project prioritization and selection. Letting you make quicker, clearer resource allocation decisions that support your strategic goals. Improving strategic alignment within your portfolio can have a massive impact. 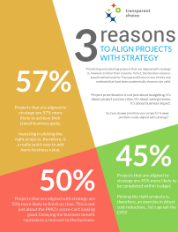 For example, PMI data shows that projects that are aligned with strategy are a massive 57% more likely to achieve their business goal than those that aren’t aligned. They are also far more likely to finish on time and within budget (click on the image to learn more). This has a direct impact on your team’s ability to deliver value to “the business”. TransparentChoice can help you do a quick audit on your current portfolio. This is a health-check that will help you identify the strategic alignment of your current projects. It also gives recommendations on how you might reallocate some resources to deliver more value.